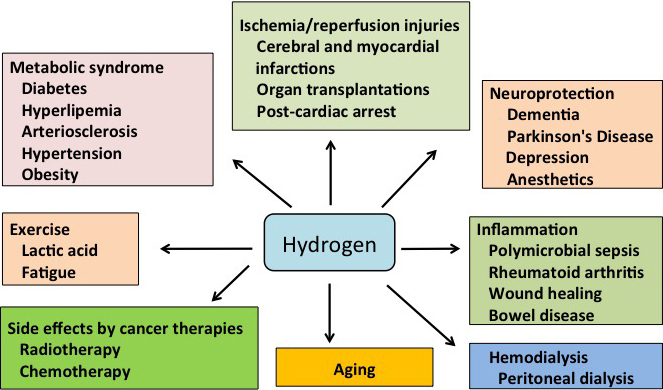 This section will explain the diverseness of action of molecular hydrogen, the development of research on the action mechanism, a proposed new molecular mechanism, and the prospect of medical care using molecular hydrogen. Since Ohsawa et al reported in 2007 that inhalation of hydrogen (H2) gas reduces ischemia-reperfusion injury in cerebral infarction model rats, there has been a significant leap in development in the research of medical use of H2, and over 300 original theses on nonclinical tests and over 20 original theses on clinical test have reported on effectiveness. As shown in FIG. 2-1, the range of illnesses or organs showing effectiveness of H2 is very wide, including central nerves, respiratory organs, circulatory organs, digestive organs, eyes, ears, liver, kidneys, skin, teeth, metabolism, bones, joints, inflammation, organ transplantation, cancer, fatigue, etc. (Ohta S, et al, 2014a; 2014b). H2 is reported to exhibit not only the anti-oxidative effect initially reported, but also an anti-inflammatory effect, an anti-apoptotic action, an anti-allergic action, a lipid metabolism-improving effect, a neuroprotective effect, an intracellular signaling regulatory effect, etc. (Ohta S, 2014a; 2014b). Even in results of clinical tests we carried out in collaboration with external institutions, improved effects in cerebral infarction, Parkinson's Disease, intraperitoneal dialysis, acute rubefaction, rheumatoid arthritis, psoriatic arthritis, and in vascular endothelium function have been recognized. As was explained in the previous section, molecular hydrogen (H2) selectively eliminates the hydroxyl radical (·OH) and peroxynitrite (ONOO-) of reactive oxygen (Ohsawa I, et al, 2007). This is an inhibitory action of H2 on oxidative damage. As shown in FIG. 2-2, this action is a chemical reaction in which H2 acts directly with these types of reactive oxygen and changes them to water, where the target molecules with which H2 reacts are ·OH and ONOO-. 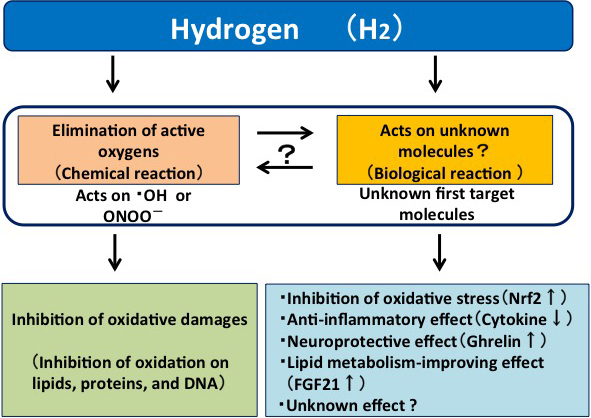 On the other hand, while H2 exhibits a variety of actions such as inhibition of oxidative stress, anti-inflammatory effect, neuroprotective effect, lipid metabolism-improving effect, intracellular signaling regulatory effect, etc., these actions have been considered until now as secondary reactions (biological reactions) that occur with signaling and regulation of gene expression, as shown in FIG. 2-2 (Ohta S. et al, 2014a; 2014b). Since it is unclear which molecule is a primary target for H2 to exhibit a variety of actions, this molecular mechanism needs to be understood. A thesis by Iuchi et al in 2016 studied the molecular mechanism regarding effectiveness of the aforementioned molecular hydrogen (H2) (Iuchi K, et al, 2016). 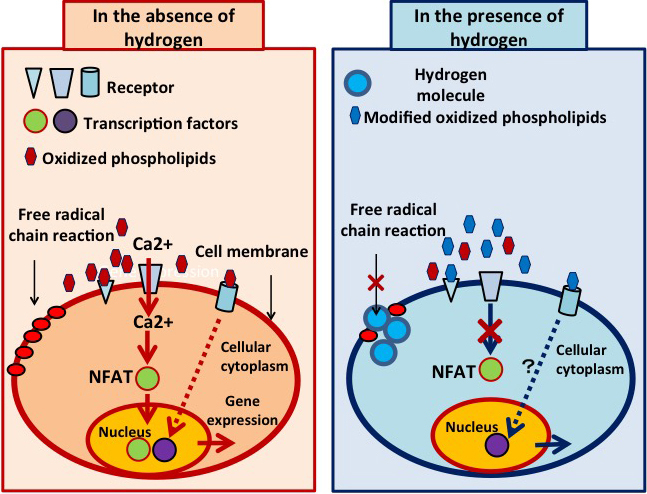 In this thesis, in order to examine the molecular mechanism of H 2 on the correlation between oxidized phospholipid and Ca2+, the experiments are conducted using a cell-free system and a cell culture system, where the following signaling pathway was proposed. Under conditions without any H2 gas (left diagram of FIG. 2-3), Ca2+, inflow (Ca2+, signal) from the outside of a cell into the inside of the same is induced when oxidized phospholipid is generated through a free radical chain reaction in the cell membrane. Due to this Ca2+, signal, calcineurin (a type of enzyme contributing to intracellular signaling) is activated and NFAT that is a transcription factor is induced, and then the NFAT is moved into the nucleus and coupled with DNA so as to send genetic information to the RNA and express a gene (mRNA). On the other hand, under conditions with 1.3 % or more H2 gas (right diagram of FIG. 2-3), as a result of H2 modifying the free radical chain reaction in the cell membrane, generation of oxidized phospholipid is modified. The modified oxidized phospholipid then acts as an antagonist, controlling Ca2+, signaling. As a result, H2 controls the path from the lower stream where the transcription factor is activated to the upper stream where genetic (mRNA) expression is conducted, which is a molecular mechanism of H2. The oxidized phospholipid modified by H2 is not specified in this thesis, and future research to specify this (or these) substance(s) is necessary. Moreover, the Ca2+ inflow path that is blocked by the oxidized phospholipid modified by H2 is unknown. Furthermore, H2 may be regulating gene expression via a signaling pathway different from the one used this time. This thesis has explained a part of the H2 molecular mechanism that has been uncertain until now; however, further study of the molecular mechanism is necessary. Research and development of molecular hydrogen (H2) for pharmaceutical use is still in progress. H2 is recognized as a food additive, and various types of H2 water (including those with very low H2 concentrations) from many companies are currently sold as food products; however, these types of H2 water are not approved as pharmaceutical products. In order for H2 water to be available for treatment of diseases, the efficacies of H2 water need to be approved by the Ministry of Health, Labour and Welfare in Japan, and approval as a pharmaceutical product must be received. Moreover, while even treatment of dissolving H2 gas in transfusion solution and then performing intravenous drip infusion and H2 gas inhalation treatment are implemented in some medical institutions, these are still in a clinical study phase for approval, as pharmaceutical products or medical equipment, from the Ministry of Health, Labour and Welfare in Japan. H2 is an extremely effective and safe gas that is available for medical use. Even the best technology does not have any significance of existence unless it leads to industrialization and can contribute to society. MiZ, “a pioneer of H2 medical use”, believes that research and development for pharmaceutical use is a challenge we have been given. Copyright © 2012 MiZ Company Limited. All rights reserved.